The harder they fall, the higher they bounce: its really that simple. Bank of America story updated with Friday's share price movements in final paragraph. NEW YORK ( TheStreet) -- Bank of America ( BAC - Get Report) bulls are feeling brilliant, as their bank is up 47% year to date, making it best performer in the S&P 500 year to date. They should be congratulated, assuming they didn't buy the shares on Sept. 8, 2008 at $34.37. That's where Charlie Peabody, analyst at Portales Partners, told them to buy. Peabody, who no doubt had plenty of bullish company at that time, finally reversed that long-held conviction this week, downgrading the stock to "hold." Bank of America still has plenty of things going for it. It still trades for a fraction of book value. It has over a trillion dollars in assets that it can use to borrow short at super-low rates and lend long at slightly higher rates, pocketing the difference. That's the banking business at its simplest, and when you have $1 trillion in assets you can make a lot of money doing that. The bank also has a powerhouse investment banking operation, and that still counts even in these dark days of finance. There aren't many U.S. institutions that big companies can go to if they want a big loan to fund an acquisition or an expansion, and so Bank of America will always be able to capture some of this business. The bank also has plenty of assets, such as real estate, that it can sell if it needs to. As for the bank's biggest problem--its exposure to problem mortgages underwritten by Countrywide Financial prior to Bank of America's acquiring it in 2008--many analysts believe Bank of America now has that issue under control. After all, it has recognized or reserved against a total of $35 billion in losses, and even in a worst case would not see more than $32 billion more, according a report from to Citigroup analyst Keith Horowitz. What's more, the bank's shares seemed to get a lift on Thursday from a giant $25 billion settlement involving it and the other four largest U.S. mortgage servicers, including Wells Fargo ( WFC - Get Report), Citigroup ( C - Get Report), JPMorgan Chase ( JPM - Get Report)and Ally Financial. While no one thinks this deal is the answer to the banking industry's mortgage headache-- least of all Bank of America's, it appears to be a step in the right direction. Still, the biggest reason Bank of America has outperformed all the other big financial stocks is this: financial stocks are up. That's right, virtually all of them are up. Of the 83 financial stocks in the S&P 500, as identified by Bloomberg, only three of them were down year to date through Wednesday. "I never hesitate to tell a man that I am bullish or bearish. But I do not tell people to buy or sell any particular stock. In a bear market all stocks go down and in a bull market they go up." This is essentially what Wells Fargo analyst Matt Burnell was arguing in his report from last month when he saidBank of America and Citigroup stood the most to benefit among large cap banks if Greece avoids a default. 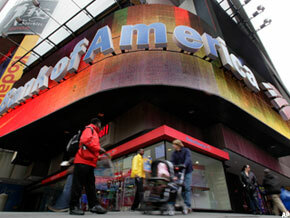 Forget about Bank of America's housing issues or Citigroup's foreign exposure. The economy is hanging on a thread that relies almost entirely upon European leaders hammering out their differences, and most Europe experts continue to believe a lasting solution to the crisis is years away and will be incredibly painful. As long as the market continues to forget that, Bank of America will be the best-performing financial stock. As soon as it comes back to its senses, Bank of America will plummet. It's that simple. Indeed, on Friday we saw an example of just this phenomenon, with the S&P 500 down 1.02% in late trading and Bank of America lower by 1.98% to $8.02.